The VOS 2018 Conference Proceedings is now available in an interactive digital format that you can download to your computer. Note: You will need the password provided to all attendees at the VOS 2018 Conference to download the files. Click on this link to access the Proceedings files. Enter the password provided at the VOS 2018 Conference when prompted. Download the VOS2018.zip file to your computer or save the file to your personal Dropbox account. Once the file has completely downloaded, double-click on the VOS2018.zip file to view the "VOS2018" folder. Keep all the files together in this folder. Click on the file named "Start.pdf" to begin viewing the files. If you attended the VOS 2018 Conference and do not remember the password, please contact VOS for assistance. Join Us for the VOS 2018 Conference! Join us in 2018 in Snowmass Village! Online conference registration has closed. On-site registration will open Saturday evening, March 10 at 8:00 p.m. in Snowmass Village, Colorado. We have opened reservations for lodging, lift tickets, and other transportation needs. To receive a discount on your registration, you must reserve your lodging with Ski.com. 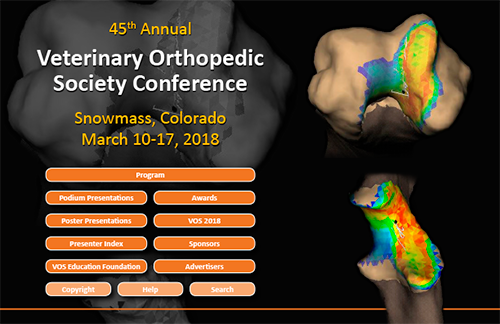 Penny Smith of Ski.com has provided final departure instructions (updated 2/23/18) for all those attending the VOS 2018 Conference March 10-17 in Snowmass Village, Colorado. Please take a few minutes to read the departure instructions to make sure your trip goes smoothly. Read the Final Departure Instructions (updated 2/23/18). For travel questions, contact Penny Smith of Rocky Mountain Tours, a division of Ski.com, at penny.smith@ski.com or 800-233-2300, ext. 3420. The Biologics Course (sponsored by Arthrex Vet Systems) will summarize current research on canine platelet-rich plasma (PRP) preparation, activation, and evidence for clinical application in dogs. Participants will obtain hands-on practice preparing PRP using both the ACP and ANGEL PRP preparation systems and will also practice activating PRP using clinically-applicable activation protocols. In addition, participants will get to practice ultrasound guided injections on canine cadaveric limbs after receiving mini lectures introducing the basics of musculoskeletal ultrasound using the new Synergy Musculoskeletal Wireless Ultrasound System. To learn more about the conference schedule, please see the conference program (updated 2/15/18). 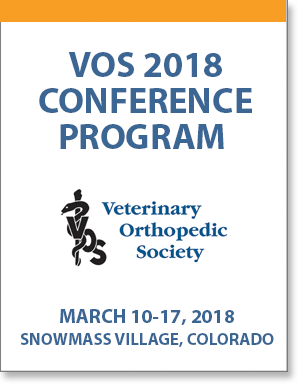 To learn more about registration and accommodations, read the VOS 2018 Conference brochure. For questions or travel reservations, contact Penny Smith of Rocky Mountain Tours, a division of Ski.com, at penny.smith@ski.com or 800-233-2300, ext. 3420. More information about the VOS 2018 conference will be posted in the months ahead. Dr. Scott Banks is a Professor in the Department of Mechanical and Aerospace Engineering at the University of Florida. Although you may not initially make the leap to veterinary orthopedics based on his department, he has been active in veterinary and human orthopedic research his entire career. Scott's research interests include joint biomechanics in animals and people in the healthy, diseased, and replaced states. His lectures in 2018 will likely include topics including radiographic measurement of dynamic skeletal motion, robotics in the operating room, and comparing human and dog knees. Scott has attended the VOS meeting in years past so he is familiar with the format and comradery of our scientific sessions.